For anyone wants to enter into Muay Thai boxing, first have to buy their kit for that matter. The kit includes a pair of Muay Thai boxing gloves, Muay Thai wristbands, Shorts, and a shin guard. If you observe every element on the kit, only boxing gloves make it to the recommended item for Muay Thai, while every other component is secondary. So it’s important to get the best Muay Thai boxing gloves for yourself and for which you might need to spend some time understanding different types of gloves available in the market. Every person has its own style of fighting and corresponding to which, the gloves will suit him the best should be his prime concern. There are gloves for various occasions such as fighting, training, sparring, punching bag, or clinching. So which is the best muay thai gloves? if you are getting overwhelmed with Muay Thai prowess, you shouldn’t worry because here we are going to the explain you different types of gloves and their traits, advantages, and weaknesses. For Muay Thai boxing, its the starting point of any beginner down the road. The selection of your gloves which is suitable for training means the extra padding, its durability and good grip around your wrist makes its a valid participant. Muay Thai training includes hitting a punching bag, pads or anything for that matter, just make sure your knuckles are well protected for that matter. Its always preferred for all the beginners of Muay Thai world to choose training valid gloves for the first time. Muay Thai bag gloves are somewhat identical to training gloves on most areas, such as extra padding at the front, more durable and soft from the inside. But the evaluating different among the later is it’s mostly light weighted, because like the name sounds, hitting a punching bag require great among of force, so its the same force is divided between hitting and pulling your heavy gloves, the muay thai bag gloves becomes a training glove. Unlike your ordinary Muay Thai Gloves, these sparring gloves are larger in size with additional protection and padding at the front to apply more power to your opponent as well stop the incoming rebound attacks. The size of sparring gloves is most larger among its predecessor so that more real estate can be occupied for better protection for your knuckles and your face for that matter. Make no mistake when you hear the name Fairtex, which is considered to be a most popular brand which makes Muay Thai gloves outside Thailand. Due to their continued commitment to producing high-quality gloves have made them a household name in the world of Muay Thai. The gloves undergo a relentless quality control tests which happen to check the composition, structure, and durability of these gloves. Entirely made of pure leather, so that you can be relaxed while jabbing at your 100 percent. Being famous for its durability, sparring gloves, on the other hand, are smaller than usual, because of their weight and size. These gloves can make you hit your lows and highs with great agility and focus. The chance to hit while your opponent has taken a guard stance is greater with these sparring gloves. The only disadvantage is its small size and improper protection from opponents hits, that’s why its a sparring, where your opponent can only take a hit and not provide back to you. 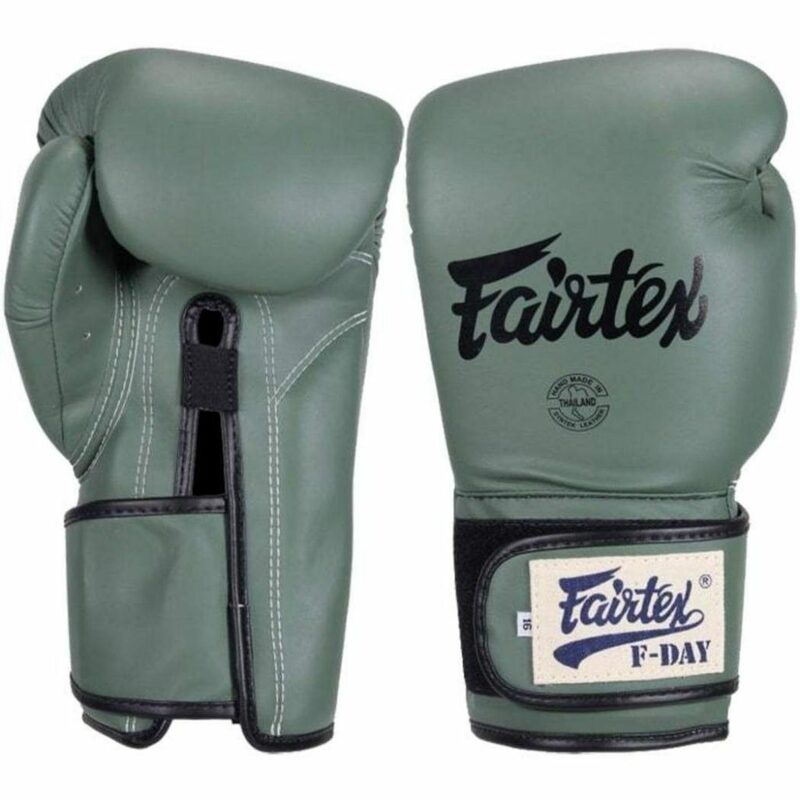 Fairtex has a good reputation for providing gloves with many colors, design, and pattern to have a sense of preference. They come in leather so it may be possible that all the sweat won’t find a place for ventilation and in the end, your gloves may stink, but these complaints are not a lot. Keeping all that in mind, buying Fairtex may loosen your pockets quite a bit, but the life, quality, and their reputation precede all these shortcomings when are looking for a great sparring session. Lightweight and smaller in size which helps to hit fast and precise. These RDX Ego Boxing gloves for Muay Thai training and sparring is best for all those beginners who just want to enter into the boxing dominion for the first time. With its price take before $50, every amateur boxer can easily get these without hurting his pockets. But don’t let the lower price tag confuse you, RDX Ego is actually a professional boxing glove which are being used for many people fighting on serious matches, but usually for training or sparring session. With low cost, comes its drawbacks so let talk something about it. If you are buying these boxing gloves with the impression of having a leather made the finish, then you are in the wrong. These Muay Thai boxing gloves are, what they called aya Hide leather’, which is actually a synthetic leader made from polyurethane leather, but of premium quality. This synthetic leather looks like a Skintex material which is more commonly found in Thai made boxing items such as gloves and boxing bags, but a little bit sturdy than Skintex. As we were discussing the drawback of using synthetic leather, of which two leads the most points, one is poor durability and lower ventilation. RDX is a well-renowned company which came into existence in 1999 at the outskirts of Manchester, and with over 200 million of the user base, they have been widely known in producing boxing equipment with good quality. Besides the quality of the material, the boxing glove has a better grip, good support and nice aesthetic presentation as a professional boxing glove. Additionally, it also provides with inner moisture-wicking fabric at the inside of the gloves which will help your hands to absorb the extra sweat and keep it cool. These gloves, as per its price tag, is not a bad bargain for a beginner who has just entered into the boxing world or for all those casual fans, who just want to see one pair in the collection. If you’re up for versatile gloves which are optimized for training, sparring or going into competitions, these Anthem Athletics STROMBRINGER gloves are the right choice for you, with only $55. The quality and comfort of these gloves are definitely commendable with an inexpensive price tag, which has made it quite reachable within most of Muay Thai enthusiasts. If you want to go full force with a punching bag or during an exhibition match, wearing these gloves will surely protect your hand without a sweat. These gloves are made up of triple-density polyurethane foam, which can handle all the stress from the front, by absorbing it significantly. The material is made up from genuine buffalo leather, so the durability is also within the grasps. The reinforced thickness and good support from the wrist had made it quite famous about amateurs and semi-professional Muay Thai boxes. For the drawback, which is pretty non-existent, except for some people have raised an issue with durability if used for a longer session of sparring or training. For all local Muay Thai lovers that have been brought up from Thailand, may hear of Twins Special. They are among the most popular brand in the region for producing best gloves for Muay Thai boxing, and of course, there is every reason for getting all that respect from the Muay Thai’s home grounds, which we are going to learn below. Thai people are all about endurance and keeping up for long hours of training, that goes with sparring as well. With the genuine cowhide leather, the durability and adequate padding make it the best choice among hard players of Muay Thai. The front protection is extremely reliable with extra cushion and padding, so for people to not hold back the extra aggressiveness in training. The gloves are large, so if you are a big guy, with larger hands, it will suit you well. Twins Special Boxing Gloves Velcro is very comfy from the frontal area, which works well for blocking even kicks attacks. With all this roominess and extra protection has given Velcro awesome respect among die-hard fans of Muay Thai. As for durability, the cowhide leather has surely made it possible to withstand even the toughest training for times to come. With everything glittering alongside Velcro, people still have some concerns about it, we received only a few complains so far. The issue is mostly due to experience some signs of rigidness when used for long hours. But as the complaints are extremely lower in numbers, then we can assume that its an all-rounder for most of the people including professionals. With everything going in the right direction, it’s still noticeable that the price tag is above the normal bar, which may be troubling for many. But the benefits that Twin Special Velcro as a store for us, the cost of this still makes us reconsider to actually go for it or not, or maybe later. This piece of wonder, Venus Elite boxing gloves just not sturdy, but have a good grip from the inside. You can use it from training, sparring, or even going beyond that, it’s still not preferred inside the ring game. It comes with extra padding at the front with suitable wrist support, so that you can handle tough training and sparring, but with the amalgamation of stress, strain and blocks may show up the contrary side of this marvel. This is most probably mid-level boxing gloves which are befitting for heavy boxing to Muay Thai, so you can understand its diversity not being for exclusive touch. For everything else, these somewhat flashy looking gloves (which only comes in Gold and silver) does make your opponent a bit jealous, but in terms of fighting, you can have an upper hand in the protection department. Comes in triple density foam for that extra padding, your knuckles can take a breath of ease for holding much stress for a longer time. Additionally, Venum Elite comes with a specific mesh panel under the thumb, which provides positive regulation for your blood, making your hand extra firm in the process. With an above average price range, the perks with it are quite adequate, as its still is preferred for amateurs and beginner Muay Thai boxes, but inside the ring and going all professional, you are advised to choose a different brand than Venum Elite.